I’m totally immature about my birthday. Every year it’s the same thing. I love my birthday the way I did when I was a little kid. 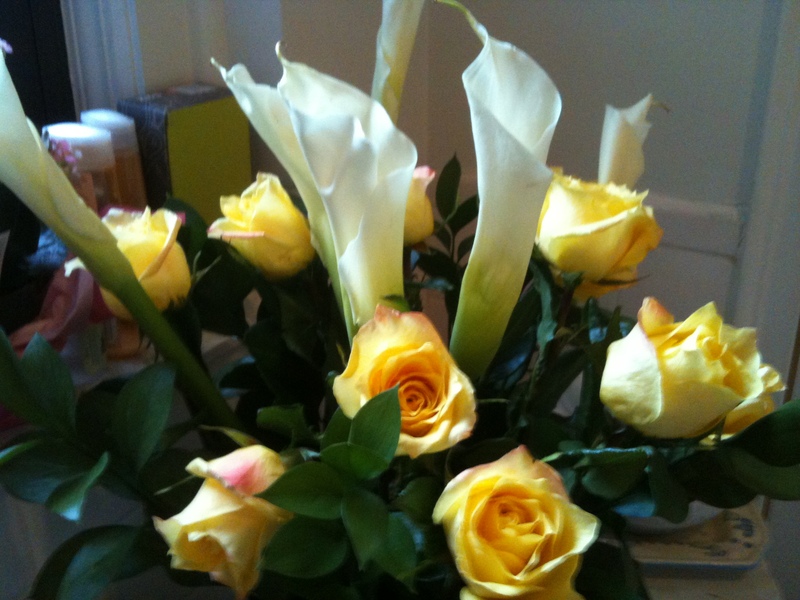 I love to celebrate, I love presents and flowers and good wine and friends. This birthday I celebrated with old friends, family, special people, clients and some new friends too. I gave myself a nice little treat and had a lovely 2003 Montaribaldi Barbaresco with Sasha Smith and Diane Letulle last night at Accademia di Vino Broadway. They are a client of mine so I won’t go on and on about the food or anything else but I do want to mention the great deal that they have on Monday nights – Half priced bottles of red wines for those over $80, like the Barbaresco I ordered and whites over $60. Last night was my first Monday there but won’t be my last. I never order Barolos or Brunellos in a NYC restaurant because of the markups but that looks like it’s going to change thanks to this 50% off deal. The wine was fabulous and didn’t over power the beef carpaccio, cheese of Truffle pizza that we paired it with last night. It was well integrated and balanced with lovely dusty cherry notes, violet, and smooth elegant tannins. I forget how lovely Nebbiolo can be when I don’t have it for a while. I didn’t know the producer but do know that 2003 was a very hot year so I was a little surprised to see that it was still so well balanced. Perhaps this Barbaresco isn’t as long lived as some other years but I certainly thought it could go for another 3-5 years. Diane a wine educator and blogger and a new friend I met at our Snooth dinner party last weekend at ‘Cesca. 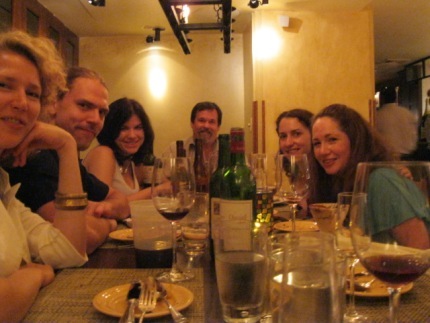 She writes of The Manhattan Wine Examiner and Wine Lover’s Journal. Sasha I’ve met on a few occasions and most recently at a Soave tasting at Colangelo Pr’s office. She also was at our Snooth blogger dinner. She writes a great blog called Spin the bottle . Eric Guido who came to our lovely Snooth Blogger dinner wrote a lovely review of his meal at ‘Cesca that I just had to share it. He pens the VIP Table blog He also gave the three of us a very big shout out. Thanks Eric. Anyway, another birthday has come and gone. Thanks to all who participated, it was just what the doctor ordered. Was delighted to be a part of the birthday celebration! Agreed that the wine was surprisingly well-balanced given the eccentricities of 2003. 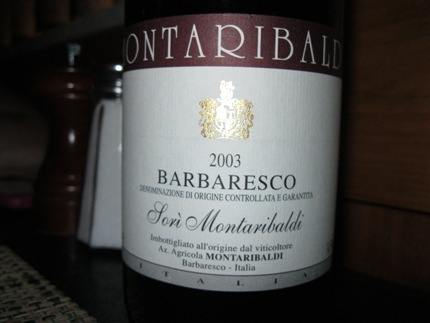 I don’t drink Barbaresco often, so this was a treat. Was great to see versatile it was–much more accommodating than some other Barbarescos I’ve had which really like to hog the spotlight. Thanks 2B. I thought of ordering your favorite, Produttori di Barbaresco but opted for something I didn’t know. 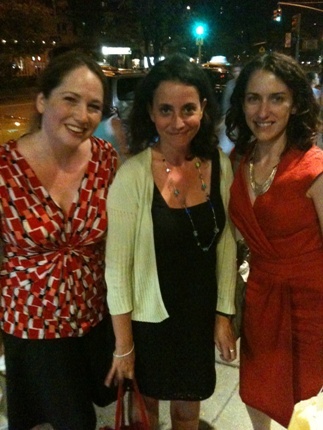 Just recently met S and D at a Bloggers dinner we had a ‘Cesca. Lots of fun. Susannah, thanks for including me in one of your birthday celebrations. I had lots of fun & look forward to sharing more evenings of good food, wine & conversation with you. Cheers!